What is it about horses that tap into our deepest empathies? Perhaps these animals are the ultimate symbol for humanity—so that when their wildness is tamed, or they are mistreated, it reminds us of our own plights. Or maybe it is just that they are innocent and beautiful. 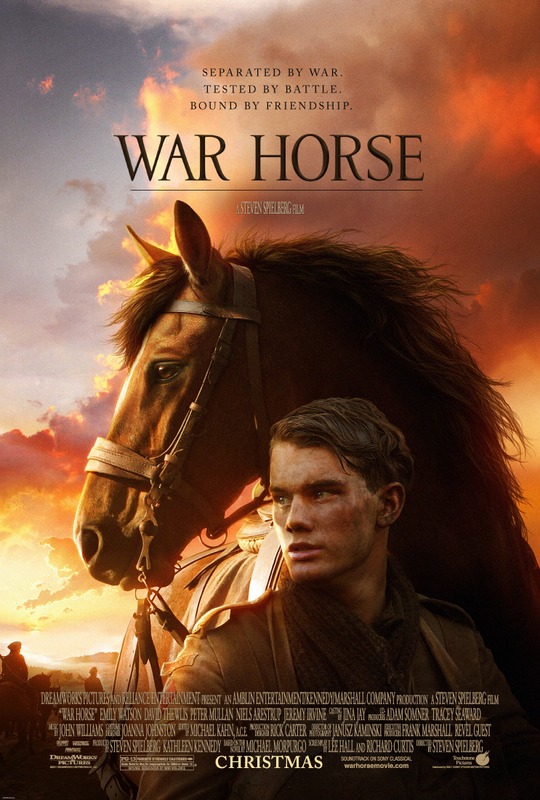 Whatever the reason, Steven Spielberg’s new film War Horse tries hard to get us to feel every emotion of its star, a horse named Joey. If Spielberg makes any mistake it is that he takes for granted this innate connection animals produce in most of us and pushes too hard. The bond between Joey and a hard-working, determined farmboy named Albert (Jeremy Irvine) is the film’s centerpiece. Albert’s father Ted (Peter Mullen) drunkenly and in a bout of competition spurred on by a bidding war with his landlord Lyons (David Thewlis) at auction, buys Joey for an astronomical price—or at least 30 guineas seems like it could buy a lot of hooch—to the exasperation of his wife Rosie (Emily Watson) who wonders how they will ever manage to make the rent. Albert volunteers to train him, and so begins a bond that spans the length of World War I. The triumph of plowing an unploughable field is short-lived due to ruined crops, so that when the war begins all Albert’s father can do is sell Joey into it, likely to his death. Al tries to follow, but too young to enlist, the horse ends up in the hands of an officer (Tom Hiddleston) who is the first in a long line of temporary owners, among them a teenage German soldier who wants to protect his underage brother, as well as a Frenchman (Niels Arestrup) and his granddaughter Emilie (Celine Buckens) whose farmhouse attempts to elude army ransacking. The battle scenes are well done, though not as realistically portrayed as those in a film like Saving Private Ryan because above all this is a movie meant to be family-friendly. I say that as a good thing, unless blood and violence are what you expected to see in a movie with “war” in the title. That said, one of the more disturbing shots is an aerial view of a field of dead horses mowed down by machine guns, the first indication of the collision between old war and new war—the man to man (and horse) combat versus modern artillery. We’re given a few scenes of trench warfare once Albert has managed to enlist to find Joey; we watch his terrifying sprint across no man’s land, so that when he finally manages to reach his goal, it is only momentarily a relief. The film is based on both a children’s novel and a stage play, the latter notorious for its use of life-size horse puppets brought to life by the men working their mechanics from the inside. Spielberg’s production on the other hand used over 300 flesh-and-blood horses in various locations throughout England in order to give the movie a realistic portrayal in a way only cinema can produce. The problem is that the plot is somewhat one dimensional, forgivable in a stage production that features artificial beasts, and where blatant symbolism is expected, but less so in a film that clearly wants to wring every last tear out of its audience’s ducts. Along with this is that many of the actors feel like they were ported over from the stage, yelling out their overdramatic lines so the people in the nosebleeds will be sure to comprehend any significance that may be present. That said, the movie is full of heart and humor and promotes an idea that none of us would deny is a worthy one: We should all be working toward a common goal instead of fighting each other. I am going to admit something now, which is that despite its over-the-top sentimentality, and my knowing full well I was being manipulated into feeling, the end of the film made me cry. What can I say? It’s a horse. You would have to be heartless not to.